This Archaic shirt is one of my favorites - I love the studs on the shoulder, the layering of the designs, and the mythical symbolism. The photo above displays the materials and stamps used. 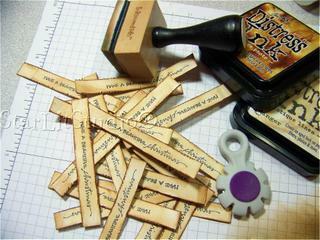 Stamps used are Tim Holtz for Stampers Anonymous (birds in flight, wings), Memory Box (petite script) and Birdhouse Words Border (Impression Obsession). Onto white cardstock cut to size (2-1/2" x 3-1/2"), the birds in flight and bird word border were stamped first with Archival Ink in Jet Black. The wings were stamped next with Distress Antique Linen, then heat embossed with clear embossing powder. 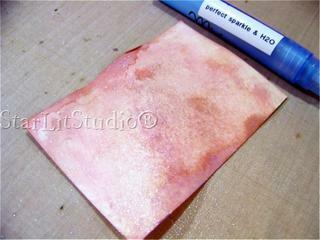 The balance of the ATC was sponged with various Distress Inks using a Blending Tool. An amber bling was adhered using Ranger's Glossy Accents. Petite script stamp is Memory Box. 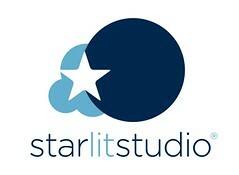 ingredients: Tim Holtz Stampers Anonymous stamps - eclecticpaperie; blending tool & replacement foam, Glossy Accents - StarLitStudio; Distress Inks, clear embossing powder, bling, Archival inks, Memory Box stamps - Ellen Hutson; white cardstock - Papertrey Ink. 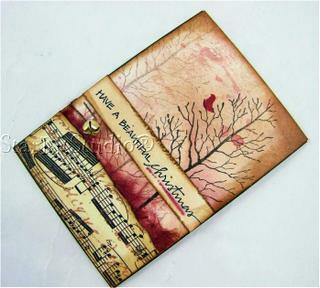 My friend Stevie hosted a holiday ATC (Artist Trading Card) swap, and I created mine using one of Tim Holtz's techniques. 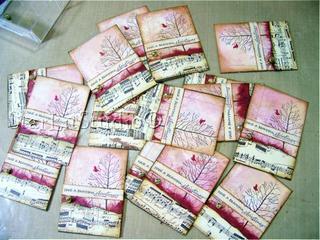 These were created assembly-line style, meaning I did all the steps at once for all 16 ATC's. Here's the directions! Step one: On a 1/2" strip of white cardstock stamp A Muse sentiment with Archival Jet Black ink (Ranger) , use Tim's Paper Distress Tool then ink distressed edges using a blending tool and Distress Vintage Photo and Antique Linen. Step two: background. 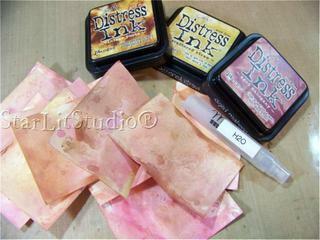 Using three Distress hues smear them onto a non-stick craft sheet, spritz with water using a Mini Mister, then drop each white cardstock ATC into the wet colors, spinning it around. Heat set and repeat spinning & drying until look is achieved. Step three: Mist each ATC with a mini mister of water and about 1/8 to 1/4 teaspoon of Perfect Pearls Perfect Sparkle This will make the inked cardstock sparkle like glistening snow! See how to do this on Tim's blog here. Iron flat with a craft iron. 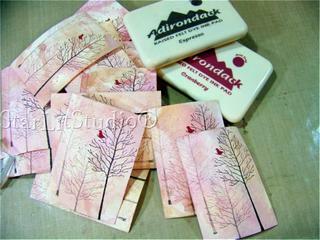 Step four: Stamp Memory Box Bare Tree (#E1125) three times without reinking using Espresso ink, and bird (Of a Feather clear set) using Cranberry ink. Step five: Adhere torn cranberry mulberry paper, a strip of 7gypsies paper with inked edges, and the verse strip from step one. As a fininshing touch, thread a mini-bell (Michaels) onto a 7gypsies mini paper clip and slip into place. Adhere another piece of cardstock to the back, sign, date & number. This uses Tim's Philosophy Tags and Hitch Fasteners, and a die-cut Cuttlebug butterfly using Swirl Grungeboard. Cuttlebug dies cut grungeboard easily. Best wishes for a great weekend!! Today's post is quick - I'm off to a field trip with my son's third grade class. 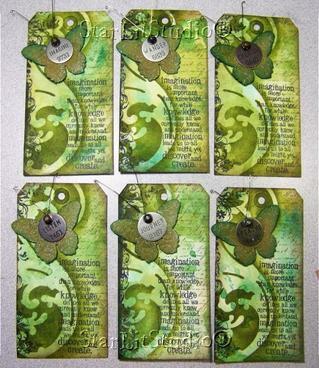 This is my Artist Trading Card (ATC) swap my good friend Stevie is having. For those unfamiliar with an ATC they are tiny - 2-1/2" x 3-1/2". 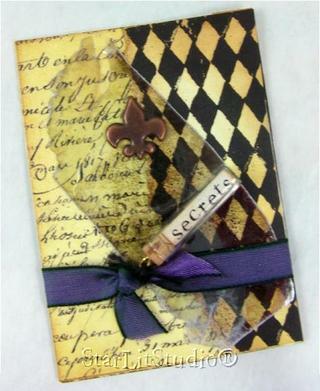 Message bottle, fleur de lis brad, 7gypsies papers and ribbon - all available at StarLitStudio. Mica is from USArtQuest. I love mica accents! The inchworm and apple card that I promised will have to wait. I gotta show you guys this ATC. My friend Stevie has ATC swaps every few months. No product restrictions, the theme was 'spring'. So I came up with these! I hate to iron clothes, but love to iron cardstock!!!! The rest of this post is how I made these, so if you are gonna stop reading now I hope you have a great rest of the weekend and hope to see you here tomorrow!! 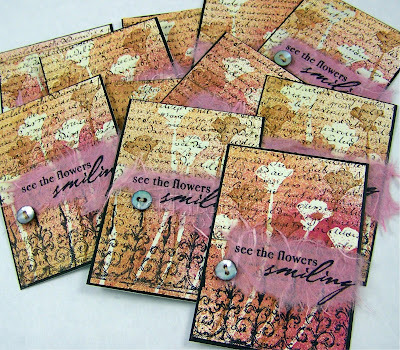 Stamp 'see the flowers smiling' (Hero Arts) onto dusty pink mulberry paper using black waterproof ink (Archival Jet Black from Ranger). Using an aquapainter or a clean paintbrush and water, paint around the sentiment and gently pull mulberry paper apart (it's fun - reminds me of pulling cotton candy apart - yum!). Set aside. Thread vintage shell buttons with tan linen thread and set aside. It is harder than it looks. Requires thread to be cut on a slant. Sometimes more than once. One button per ATC. I am now craving cotton candy. Stamp B-Line Designs Ironworks at base of Catania paper in same waterproof ink. 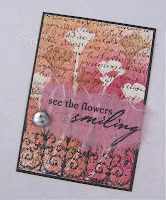 Stamp Hero Arts A Real Wild Poppy flower repeatedly in Distress Embossing Ink pad. Submerge in clear embossing powder and heat set. Stamp Poppy image repeatedly using Vintage Photo Distress pad. Now, the really fun and messy part starts! Get a worksurface and get some Glimmer Mist. I used Black Cherry and Aspen Yellow (from Eclectic Paperie!). My worksurface is a 18x24 piece of thick matboard that has seen better days but in some ways is attractive (like me in the morning!) To describe the matboard, think of what the floor would look like after a half dozen three and four-year-olds played unsupervised with 50 bottles of Glimmer Mist. Well that is what my matboard looks like! I placed two Bounty paper towels on top of the worksurface to absorb some of the Glimmer Mist and went to town. First I sprayed them all over with a few hits of the Aspen Yellow, then I hit them from the right side only (very important) with one good spray (or two not so good sprays) of the Black Cherry. I decided that was not enough color variation for the look I wanted, so I took a mini-mister and put a whole dropper full of Distress Brushed Corduroy reinker and about 1/8 tsp. of gold Perfect Pearls. Filled the mister about 3/4 full (gotta leave room for the stuff to shake, shake, shake!) with water and shook it up real good. I spritzed this solution in areas that needed to be a bit darker. Your ATC's will curl due to all that liquid combined with the thin nature of the Catania paper, but we'll take care of that in a minute. Anyway, presto! Instant ironing board! On top of the craft sheet I placed two more Bounty towels, placed an ATC face down, and ironed. Repeat for all ATC's. And if you are like me and saw this for the first time, I'd be asking you, "how did you do that?!" To finish up, affix the stamped mulberry paper, glue the vintage button, trim the ATC down a tad and mat onto ATC sized black cardstock (Memory Box Licorice). Sign, date and number and...done!